These aren’t a little-known Mexican specialty I sussed out from the pages of some obscured cookbook. No, we created them at Frontera to celebrate an amazing, flinty heirloom cornmeal that had been raised by the Iroquois nation since time immemorial. It can be made with a special yellow or white or blue cornmeal you discover, too, or with cornmeal from the grocery store—you have lots of choices. 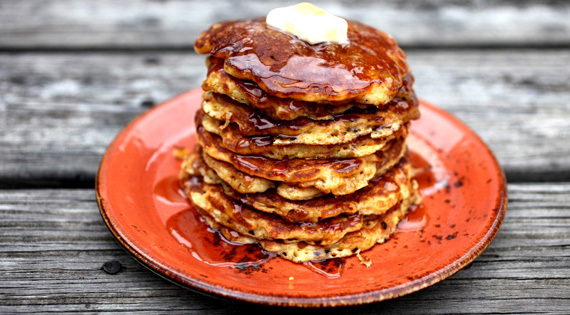 First choose the texture of the pancake: a coarser grind of cornmeal gives the pancake a bit of crunch. Then choose its thickness: less buttermilk gives you a thicker, heftier pancake, while more gives you one that’s lacier and lighter with a creamy texture. Heat a heavy (preferably nonstick or seasoned cast iron) griddle or very large (12-inch) skillet over medium until it’s hot enough that a drop of water skips across the surface and evaporates almost immediately. Use a tablespoon of butter to film the surface, then pour the batter onto the hot griddle, using about a ¼ cup per pancake. Leave an inch of space between each one. Cook until bubbles form and pop on the surface, about 2 minutes, then flip the pancakes and cook until golden-brown on the other side. Transfer to a baking sheet and keep warm in a low oven. Repeat with the remaining batter, re-greasing the griddle between batches, until all has been used. Serve the pancakes immediately with the warm syrup. A Savory Riff on Cornmeal Pancakes: There’s nothing inherently sweet in the pancakes themselves, so sometimes, I like to make them small and serve them as a savory light dinner with dollops of Greek yogurt, crumbled crispy bacon and a spoonful of salsa. Scrambled eggs can work themselves into the mixture, too, if you want. And some crumbled hot-smoked salmon (or practically any other smoked pork product) is a delicious replacement for the bacon.